This holiday season is bringing a flurry of emotions for me, and I have a better understanding of how stressful this time can be in the families we serve. Lately, it has been a reminder of special people that are no longer sitting across the table from me, and family members living too far away to see daily. But I am trying instead- to use this opportunity to become more mindful and present in the moments I do have with those I care about. We don’t have to celebrate Thanksgiving to be grateful; we can do that every day. In my professional life- I am grateful for our sponsors that make our work possible. Every year, our sponsors make a financial decision to part with some of their hard-earned dollars and support a comprehensive guide for the families in our community. This is just more than just a marketing piece. 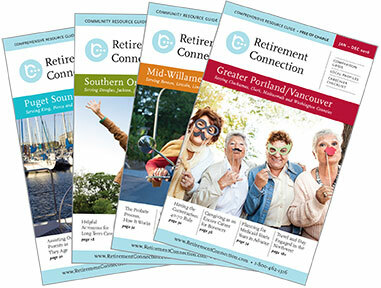 Would you notice if there was not a Retirement Connection? Would you miss: having one convenient guide with every community and support listed; posting of the networking meetings in a single newsletter; attending the Release Party- the largest networking event of the year; connecting with case managers at the hospital resource fairs? If you benefit from any of this- please thank the many sponsors of Retirement Connection and refer to their businesses when possible. Time is almost up to take advantage of the 10% Early Bird Discount that ends this week. Reserve your space now for the next edition and save 10%; payments and artwork are not due until summer. Please NOTE that we will be having our first rate increase in 10 years. The increase is due to higher paper costs and increased distribution. If you take advantage of the early bird rate- you will NOT see a rate increase and will also save the additional 10%. The average increase will be $200 per ad. Other exciting news- We are coordinating our first Case Manager Resource Fair for the Good Samaritan Hospitals. Registration is now open for our sponsors. Space is limited- please register early. PLEASE NOTE THE LOCATION CHANGE! 9:30 AM Save the date! 9 AM Save the date! Do you know someone that has recently changed positions? Send us an update to share in the monthly newsletter, helping everyone stay connected and informed about community changes. Sometimes gratitude can just be a matter of perspective. ...the mess to clean after a party because it means I have been surrounded by friends. ...the taxes I pay because it means that I am employed. ...the clothes that fit a little too snug because it means I have enough to eat. ...my shadow who watches me work because it means I am out in the sunshine. ...a lawn that needs mowing, windows that need cleaning and gutters that need fixing because it means that I have a home. ...the spot I find at the far end of the parking lot because it means I am capable of walking. ...all the complaining I hear about our government because it means we have freedom of speech. ...my huge heating bill because it means that I am warm. ...the lady behind me in church who sings off key because it means I can hear. ...the piles of laundry and ironing because it means my loved ones are nearby. ...the alarm that goes off in the early morning hours because it means that I'm alive. ...weariness and aching muscles at the end of the day because it means I have been productive.